Backwoods Home Magazine is now a print magazine after a one-year hiatus as a digital-only publication. The person who is making this possible is my son, Sam Duffy, who will assume the role of publisher, a job I have had since founding BHM 29 years ago. The magazine’s content will remain unchanged. Sam is 23, compared to my 74 years, so is more in touch with the new technologies that have so dramatically altered the publishing landscape. 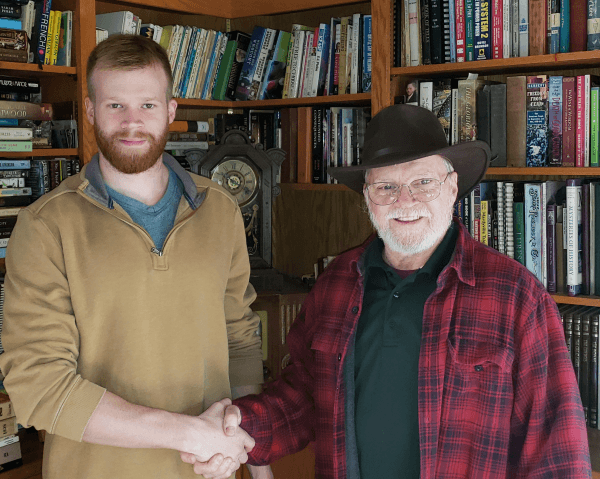 He is also about to take a business degree from Oregon State University, and his primary project for the last year has been running his own print magazine, Self-Reliance, and restarting Backwoods Home Magazine as a print publication. Both Backwoods Home Magazine and Self-Reliance will now be jointly owned by Sam and my daughter, Annie Tuttle, who own the umbrella company, Self-Reliance Publications. Annie is the current managing editor of Self-Reliance, the former managing editor of BHM, and someone who longtime subscribers have seen grow up in the pages of BHM. Like Self-Reliance, BHM will be published four times a year. I am delighted that my children will carry on my legacy. I will continue writing the “My View” column at the front of the magazine. All of our key writers will remain, from Jackie Clay-Atkinson, John Silveira, and Massad Ayoob to Jeff Yago, Patrice Lewis, and Linda Gabris. Jessie Denning, BHM’s managing editor, will stay at the editorial helm, and I will continue to guide the overall editorial content. I’m so excited to hear this!! I just made a video on my YouTube channel on how BHM was the best magazine ever printed. Now I’m going to have to make another one letting my viewers know you’re back in print! We have begun mailing new issues out. Can you email us at customer-service@backwoodshome.com or call us at 541-929-7106 and we can figure out why you haven’t received anything yet. Yes! Don will continue to produce fantastic covers! Although he’s about to turn 89, his passion for art hasn’t diminished in the slightest! Is Don Childers still doing your art for covers etc. You’ve had some great covers and art in the past—hope it continues. Hey grampa it’s Anthony very good job.